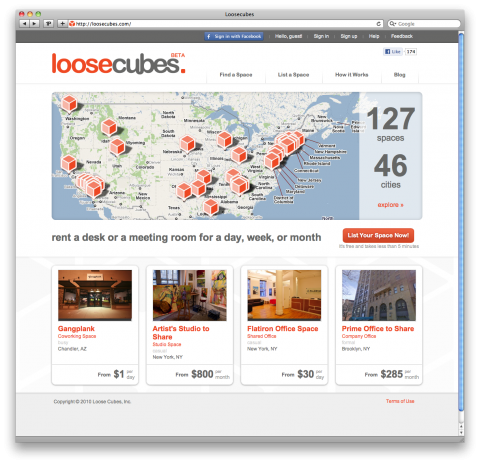 Loosecubes is a community of independent people building a global network of shared workspaces. They bring together people who have great space and people who want to work in it. At Loosecubes, they want to change the way people work. Their members need the flexibility to work at home sometimes and in an office sometimes. They want the freedom to travel anywhere in the world and not have to worry about finding an internet connection and some intelligent people. They don’t think that Loosecubes hosts will participate just to make some extra money. They think they will participate because members are people they want to get to know. They’ll participate because they believe, that the only way to be truly independent work-wise is to have great workspace available when you need it – without paying an arm and a leg. Find a big space and invite your friends and colleagues to work together. Spend a month coworking or a few weeks in another country. Fantastic idea. We might just have to expand and put some desks up on Loosecubes here at swissmiss studio. I just love this idea of sharing work space and ideas. Must try this sometime. good to see all the spaces in the u.s.
thank you thank you very much admin nice post..